Collaborative installation with Kate Ingold. 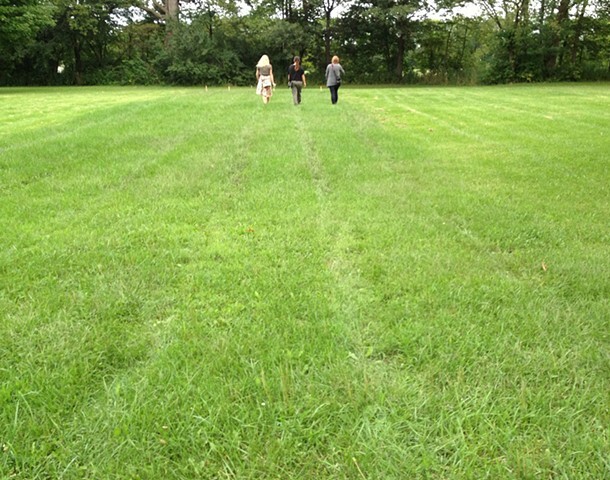 Situated on an expanse of meadow at Perry Farm Park, the artists marked a faint linear path in the grass by walking repeatedly back and forth, replicating multiple rows of farm field. Visitors were encouraged to participate in the ongoing creation of the piece throughout the duration of the two month installation. As each person walked, their footprints left a matted path in the grass. Over time, as the surrounding blades grew, the pattern became more and more obvious. The physical act of each participant walking the rows, back and forth, replicates the movement of Thomas Durham, when he first started farming the land in 1835 and the subsequent farmers after him.